Virginia City, like so many other Nevada towns, started life as a mining boomtown. Following the Comstock Lode silver strike in 1859, Virginia City exploded literally overnight and, for a moment in time, became the wealthiest city in the United States. Yet, like all other Nevada mining boomtowns, once the silver started to run out, the population of Virginia City fell sharply. From a high of over 10,000 people during the peak years in 1880, the population fell to less than 3000 people by 1900 and less than 1000 people during the 1920’s. However, unlike other Nevada mining boomtowns, Virginia City didn’t fade away in the vast and lonely Nevada desert. Instead, Virginia City has today become a popular tourist destination. Declared a national historic district in 1961, Virginia City today caters to thousands of tourists a day during the busy summer season. The downtown area of Virginia City has been nicely restored to resemble the look, if not quite the feel, of the Virginia City of old. Dozens of businesses sell everything from ice cream, tourist trinkets, western wear and much more. Numerous restaurants are also in the downtown area. 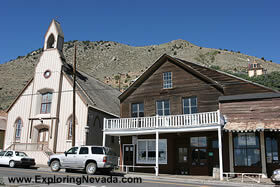 Finally, Virginia City has several museums and dozens of historic buildings in town. The location of Virginia City has greatly assisted its economic prosperity. Unlike so many other Nevada mining boomtowns that were, literally, located near nothing, Virginia City had the good fortune to be close to Carson City and Reno. As such, many people live in Virginia City and take the short drive into the cities to work. Additionally, Virginia City is located at an elevation of over 6000 feet. As such, the weather in Virginia City, even during the height of summer, is usually pleasant – with summer nights usually being rather chilly. The combination of cooler weather and numerous activities to do in town is one reason why Virginia City is so busy during the summer months – the locals from Reno and Carson City head to town to escape the warmer weather found down in the Carson and Washoe Valley. 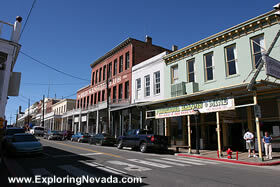 Virginia City is especially busy when “special events” come to Reno. Virginia City is also located on the Virginia City Scenic Drive, which follows Nevada State Highways 341 and 342. The portion of the drive between Reno and Virginia City is especially scenic, and is one reason why Virginia City sees so many visitors from the Reno area during the weekends. Lake Tahoe is also an easy drive from Virginia City, and one of the routes to Tahoe follows the beautiful Mt. Rose Scenic Drive. Overall, anyone visiting the Lake Tahoe Basin, Carson Valley or Washoe Valley should take the short drive up to Virginia City. Anyone who enjoys historical buildings and the flavor of an old mining town will enjoy their visit. Nearby Carson City is the best place to stay when visiting Virginia City. Of course, Reno isn't far away, either.